Chatting Over Chocolate: *NEW BLOG SERIES! * 35 by 35! *NEW BLOG SERIES! * 35 by 35! Welcome to my NEW blog series, "35 by 35"! 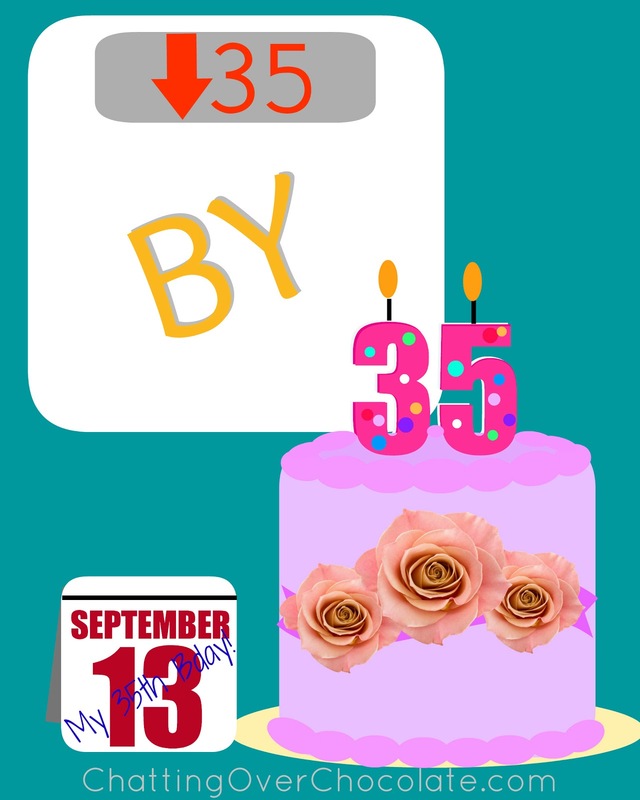 I've set a goal for myself to shed 35 UNwanted pounds by my 35th Birthday. Today is Day 1 of my challenge and I couldn't be more excited about it! Today I'll be sharing my game plan and a taste of what you can anticipate in each of my 35 by 35 posts, including: Food Finds, Delicious Ways to Shrink, TIP of the week, My Progress Report, & a (Comments) Cheering Section! *I am not attending WW meetings, nor am I affiliated with them in any way. I'm simply using their old points system as a guideline for my dietary plan. We're officially making fitness a family affair! 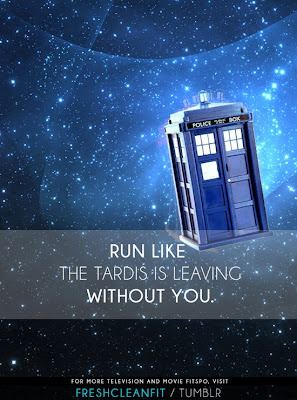 My hubby, girls, and I will begin Couch-to-5K this Saturday. I first used this program in the Summer of 2011 and I cannot say enough good things about it! It took me from loathing running to loving it! It's been a while since I headed out in my running shoes, so starting from week one with my family will be a fantastic way to ease back into it! I can hardly wait! *If you decide to join me in starting week 1 of Couch-to-5K this week, check out their helpful app! It makes it so simple! Now that you know the plan, I'm excited to share my first food find, delicious way to shrink, and tip with you! 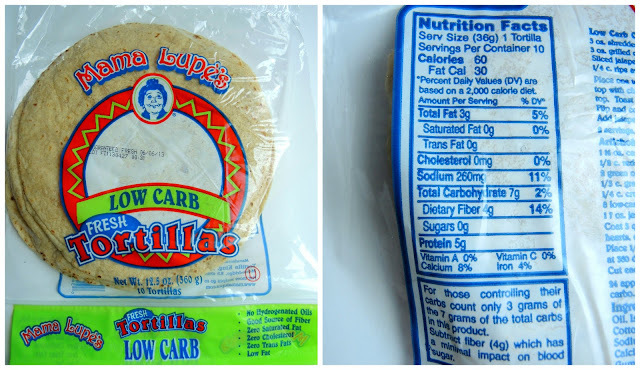 I LOVE these tortillas! They're only 60 calories each, low carb, and with 4 grams of fiber they are filling! I've spotted these at Hy-Vee and Wal-Mart. 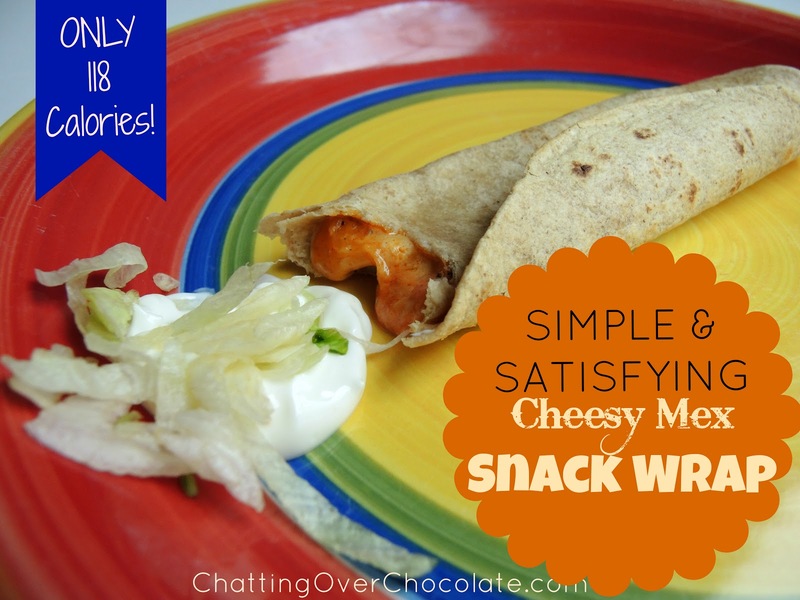 Yesterday I used this week's food find to create an easy, peasy, and deliciously cheesy wrap. It was so yummy (and low cal!) that I actually made a second one. ;) Nothing fancy, schmancy, yet it takes only a few minutes to whip up and everything in the photo below is only 118 calories! It's a fantastic and quick lunch option! 1. Sprinkle 1 TBSP of Taco Cheese down the center of the tortilla. 2. Pour Taco Sauce alongside cheese. 3. Dallop and spread 1/2 TBSP of Sour Cream beside the sauce. 4. Wrap burrito style, tucking both ends down first, then rolling until wrapped. 5. Cook on stovetop in frying pan/skillet. Turning to brown both sides to your liking. 6. Dallop the other 1/2 TBSP of Sour Cream on plate and sprinkle lettuce on top for dipping. Want to make it lighter? Try using Fat Free Sour Cream. Would you like it a little spicier? Toss in some sliced jalapeno peppers! Rather than serving your meals "family style" in the dining room, serve yourself in the kitchen before making your way to the table. When platters of tempting food are right there in front of me I find that it's easy to nibble here and there or spoon up a little more for myself, often without even thinking about it! Keeping the entree and sides off the table helps me enormously! It forces me to make a conscious decision to CHOOSE what I'm going to eat. Give this a try! In my 35 by 35 posts I'll be turning my comments section into a Cheering Section! If you'd like to join along and set a weight loss and/or fitness goal for yourself please leave a comment below and let me know. I invite you to come back next week and share your progress. I'm ready to cheer YOU on too! Whether you choose to participate or grab some pompoms, please let me know if you plan to follow my series. Knowing that I'll be accountable to you will be a huge motivation! Thanks in advance, friends! Your support means so very much! Congrats on making this commitment, Brenda! I've made a commitment to myself to lose 30 in 30...30lbs. in 30 weeks. I started 2 1/2 weeks ago and am doing pretty well. The weight comes off slowly, but I'm excited to see the needle moving in the right direction. I'm using My Fitness Pal to track my food and keep me at 1300 calories for now and I've added in some exercise most days of the week. I should look into the C25K program too. My whole family could benefit from it. I'm looking forward to your motivating posts and low cal ideas! Best wishes! Love it! Looks like you've got a great plan. Will have to try snack wrap - yum! Way to go at setting a plan and putting it into motion! I love 40 lbs before my 40th birthday and feel so great! I have more energy and feel so much better than I have in probably 20 years. It may have it's hard moments, but stick with it...it will sooo be worth it. Thanks so much for linking up at the Real Family Fun link party! Hope to see you next week.